This data set provides Level 4 estimates of Net Ecosystem Exchange (NEE) of CO2 across the conterminous USA at a spatial resolution of 50 km. Modeled estimates are provided at hourly and monthly temporal resolutions, from January 2012 through October 2014. The AirMOSS L4 Regional NEE data were produced by the Ecosystem Demography Biosphere Model (ED2) augmented by the AirMOSS-derived L2/3 root zone soil moisture data as an additional input. The AirMOSS soil moisture data were used to estimate the sensitivity of carbon fluxes to soil moisture and to diagnose and improve estimation and prediction of NEE by constraining the model's predictions of soil moisture and its impact on above- and below-ground fluxes. This data set includes 1069 files in netCDF (*.nc4) format: 34 monthly files and 1035 daily files. Daily files contain NEE data at an hourly resolution. The algorithm theoretical basis document (ATBD) for this data product is included as a companion file. 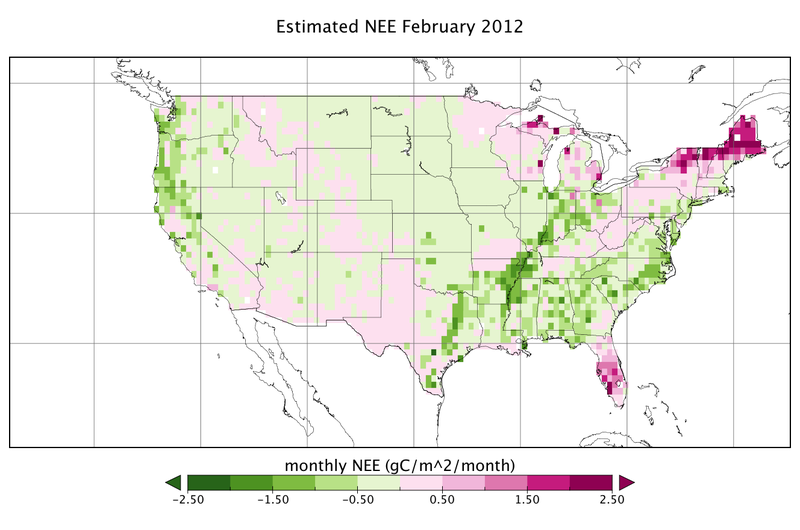 Figure 1: Estimated continental-scale Net Ecosystem Exchange (NEE) of CO2 in February 2012. 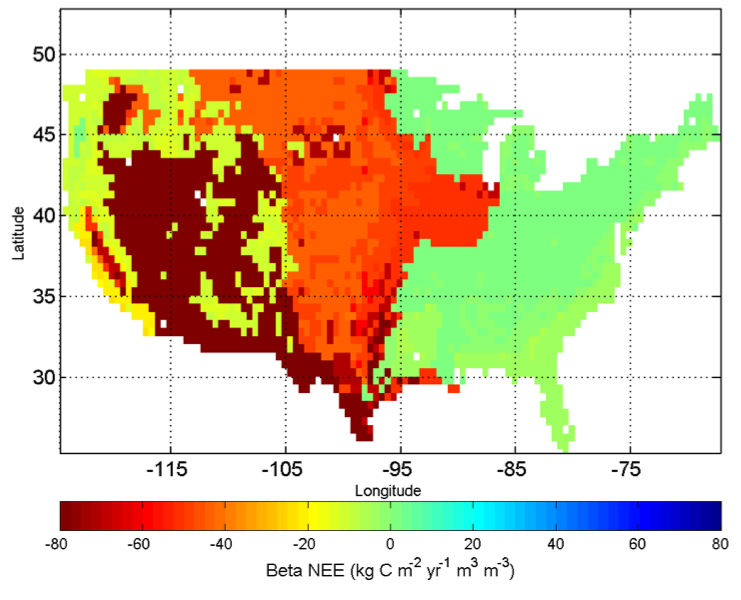 This data set provides Level 4 estimates of Net Ecosystem Exchange (NEE) of CO2 across the conterminous USA at a spatial resolution of 50 km. Modeled estimates are provided at hourly and monthly temporal resolutions, from January 2012 through October 2014. The AirMOSS L4 Regional NEE data were produced by the Ecosystem Demography Biosphere Model (ED2) augmented by the AirMOSS-derived L2/3 root zone soil moisture data as an additional input. The AirMOSS soil moisture data were used to estimate the sensitivity of carbon fluxes to soil moisture and to diagnose and improve estimation and prediction of NEE by constraining the model’s predictions of soil moisture and its impact on above- and below-ground fluxes. This data set includes 1069 files in netCDF (*.nc4) format: 34 monthly files and 1035 daily files. Daily files contain 24 data layers, one for each hour of the day. Monthly files contain one data layer, showing the estimated net ecosystem exchange for the whole month. The algorithm theoretical basis document (ATBD) for this data product is included as a companion file (AirMOSS_L4NEE_ATBD_V2.0_160928.pdf). Table 1. Data fields in the L4 Regional NEE data files. Missing data are represented by -9999. Date of modeled output. Daily files: hours since 2010-01-01 00:00:00 UTC. Monthly files: months since 2010-01-01 00:00:00 UTC. Figure 2. Patterns of NEE sensitivity to changes in soil moisture across the continental US (notation based on Friedlingstein et al. 2006). There are several qualitatively different sources of error in the L4A/B-NEE products. These include 1) uncertainty in initial ecosystem structure and composition, 2) error in phenology, 3) errors in the meteorological forcing, 4) errors in the AirMOSS RZSM, and 5) model process error. The contributions of these different sources of error to the NEE estimates are described in the accompanying ATBD for this data product. Figure 3. 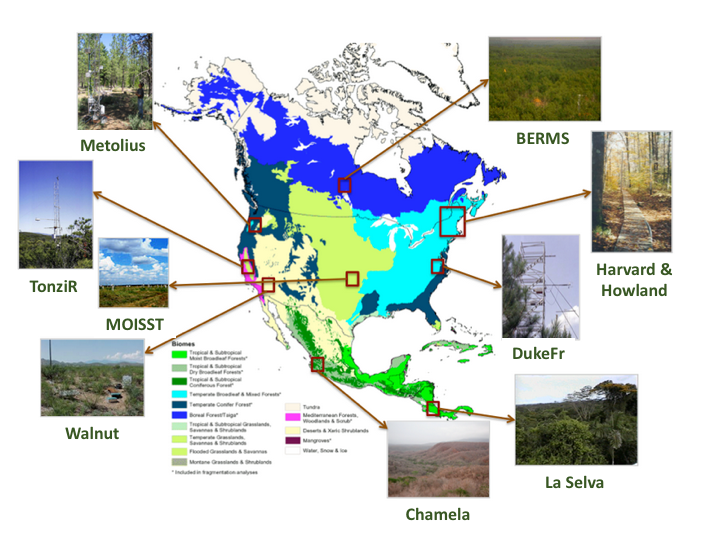 AirMOSS study sites were co-located with flux towers in nine different biomes across North America. For AirMOSS, NASA's Uninhabited Aerial Vehicle Synthetic Aperture Radar (UAVSAR) was flown on a Gulfstream-III aircraft, making frequent flights over ten sites (Table 2 and Figure 3) in 9 different biomes of North America over the course of four years (Chapin et al. 2012). Root-zone soil moisture and its spatial and temporal heterogeneity influences NEE. The L4B-NEE product consists of hourly and monthly estimates of carbon fluxes over the continental United States at 50km resolution. We used two approaches to scale the L4A-Daily-NEE products to the continental United States. 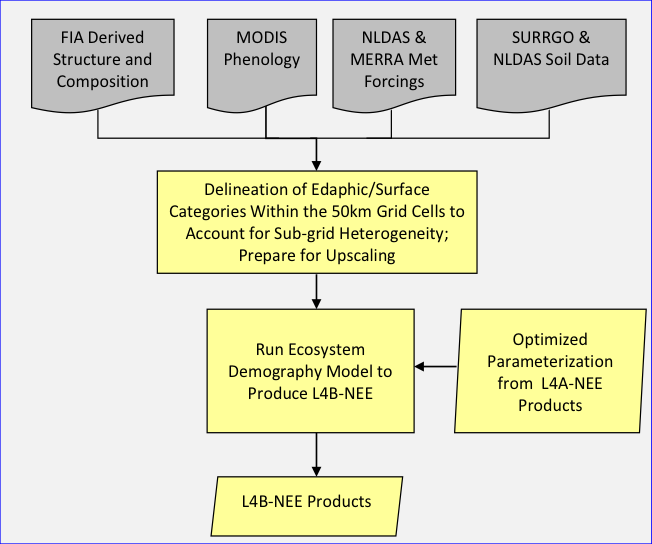 The first method was to implement the Ecosystem Demography Model (ED2; see Medvigy et al., 2009) simulation algorithm developed for L4A-Daily-NEE a coarser spatial resolution of 50km. The second was a statistical extrapolation of L4A-Daily-NEE products onto the 50-km resolution continental-scale grid. Details of both procedures can be found in the algorithm theoretical basis document (ATBD) for this data product, included with this data set, AirMOSS_L4NEE_ATBD_V2.0_160928.pdf. Figure 4. Multiple ancillary data sources were aggregated to the CONUS 50km grid cells relative to certain edaphic/surface conditions. The final L4B-Regional-NEE outputs were produced by the ED2 model.